Draft: 2000, Philadelphia Phillies, 1st rd. Chase Cameron Utley…married Jennifer Cooper; has two sons, Benjamin (12/2/11) and Maxwell Chase (10/4/14)… launched the Utley Foundation, which brings awareness to the epidemic of animal cruelty, and holds annual fundraising events to support its mission…since 2008, has raised over $1 million for the Pennsylvania SPCA and has hosted All-Star Animals Casino Nights with wife Jennifer to benefit the organization…the Utleys have also spearheaded fundraisers, including Save a Pet at the Park, a pet calendar and taped PSAs for PSPCA…he created the Chase's Champs charitable ticket program during his time in Philadelphia and annually donated full season tickets to patients from the Children's Hospital of Philadelphia (CHOP) and St. Christopher's Hospital…was honored for his dedication to giving back to the community with the Phillies Community Service Award and was the club's Roberto Clemente Award winner, both in 2013.. originally selected by the Dodgers in the 2nd round of the 1997 FirstYear Player Draft out of Long Beach Poly High School, but did not sign…he was then selected by the Phillies in the first round (15th overall) of the 2000 First-Year Player Draft and signed by scout Matt Lundin. In his 15th big league season and his third with the Dodgers, he hit .236 with 43 runs, 20 doubles, four triples, eight home runs and 34 RBI in 127 games…also recorded nine hit by pitches, which tied for 17th most in the NL ... Spent the majority of season at second base (80 games, 68 starts, .978 fielding percentage), but also played in 17 games (10 starts) at first base ... Drove in his 1,000th career RBI on July 7, 2017 against the Royals to become the ninth active player to accomplish the feat ... Had reached base safely in all three plate appearances on May 18 against Miami, going 2-for-2 with a run, two RBI, a walk and a stolen base and according to Elias Sports Bureau, he became the first leadoff batter with a sac bunt, sac fly and stolen base in one game, while getting hits on each of his at-bats since the sac fly rule was born in 1954 ... Appeared in nine postseason games for the Dodgers, going 0-for-15 with one run scored, two walks and two hit by pitches…at 38 years old, he became the oldest player to score the go-ahead run in a World Series elimination game since Enos Slaughter (41 years old) in 1957. Batted .212 with eight homers and 39 RBI in 107 combined games with the Dodgers and Phillies in his 13th big league campaign • Acquired by Los Angeles from Philadelphia on Aug. 19 with cash considerations in exchange for minor league infielder/outfielder Darnell Sweeney and minor league pitcher John Richy. ... With Los Angeles, batted .202 with nine doubles, a triple, three homers and nine RBI in 34 games. ... Made the first appearance of his career at third base on Sept. 21 against the D-backs and started three games at the hot corner without an error…also combined to appear in six games (three starts) at first base and 88 games (87 starts) at second base, posting a .982 combined fielding percentage (eight errors). ... Played in 73 games for the Phillies, batting .217 (54-for-249) with 12 doubles, a triple, five home runs and 30 RBI…placed on the DL from June 24-Aug. 7 with right ankle inflammation. ... Appeared in three NLDS games for Los Angeles against the Mets and went 1-for-3 with a run scored. Began the season on the 15-day DL withchondromalacia; did not participate in any springtraining games for the 2nd straight year... Played in a combined 10 rehab games with Clearwater(A) and Lehigh Valley (AAA) before being activated (.189,7-37, 2 HR, 6 RBI)... Homered in his 1st at-bat of the season, 6/27 vs PIT... After making his season debut on 6/27, led the team ingo-ahead RBI (16), walks (43), HBP (12), SF (6) & OBP(.365) and T-1st in hits (77)... Of his 11 HR, 4 gave the Phillies a lead and 2 tied thegame... Reached base safely in 70 of 81 starts (86%)... Batted .301 (25-83), 4 2B, HR, 16 RBI in his final 24 games... T-7th in the NL in HBP (12). Began the season on the 15-day DL with right kneetendinitis/chondromalacia; did not participate in any spring training games...Was activated on 5/23 following 9 rehab games with single-A Clearwater (7 at 2B, 2 as DH); also batted .429 (6-14), 2 HR in 2 extended spring training games as DH,5/7-8...Got his 100th career SB, 6/29 vs BOS...Set the Phillies record for most games played at 2ndbase (1,004), 8/12 vs WSH...Left the game, 9/7 vs ATL, in the bottom of the 8thinning with a possible concussion after getting hit in thehelmet by a pitch in the bottom of the 6th inning;missed the next 7 games (9/8-14)...Reached base safely in 91 of his 103 games (88.3%)...The Phillies averaged 4.84 runs in games he appeared in(499 R/103 G) compared to 3.6 runs in games he didnftappear in (214 R/59 G)...Was successful in 14 consecutive stolen base attemptsto extend his streak to 20 straight steals, dating to the2010 season...Committed 1 error in his final 46 starts (219 TC)...Set a career high for hits in a playoff series (7) in NLDS. Led the NL in HBP (27), T-5th in extra-base hits (78) and runs (113), 6th in total bases (325) and times on base (268), T-7th in games (159) and SF (8), 9th in SLG % (.535) and IBB (14), T-9th in HR (33) and go-ahead RBI (25), T-10th in hits (177) and doubles (41)...Led all NL 2nd basemen in hits, doubles, HR, RBI, runs, XBH, total bases and SLG %...Defensively, led all NL 2nd basemen in total chances(816) and assists (463) and finished 3rd in fielding %(.984)...Made his 3rd straight start at 2nd base for the NLAll-Star team (1-3) and competed in the HR Derby(hit 5 in the 1st round)...Finished 15th in NL MVP voting (30 points)...Became only the third 2nd baseman in MLB history tohave 4 straight 100-RBI seasons, joining Jeff Kent (6,1997-2002) and Charlie Gehringer (5, 1932-36)...Set career highs in HR and SF...Became the first 2nd baseman in MLB history to have10 HR before the end of April and the 1st Phillie infranchise history to end June 1 at 20 HR...Had his 14th career multi-HR game, 4/4 at CIN,including his 100th career HR (Jeremy Affeldt)...Broke his own Phillies record with 27 HBP (had 25in 2007)...Set a Phillies single-game record with 3 HBP, 4/8 atNYM, becoming the first MLB player to get hit 3 timesin a game since 7/3/06 (Nomar Garciaparra)...Collected his 150th career double, 4/6 at CIN, and his400th career RBI, 4/18 vs NYM...Had an extra-base hit in 8 straight games (3 2B, 7 HR),4/16-23; since 1956, only one other 2nd baseman hada longer streak (Pete Rose - 9 games, 7/31-8/8/66)...Twice tied a Phillies record by homering in 5 straightgames, 4/17-21 (6 HR total) and 5/28-6/2 (5 HR total),becoming one of only 4 players in MLB history to havetwo 5-HR streaks in the same season; Harmon Killebrew(1970), Frank Thomas (1994) and Barry Bonds (2001)were the others...Reached base safely in 26 straight games, 4/8-5/5(.442 OBP)...Won NL Player of the Month honors for April (.352,10 HR, 21 RBI)...Hit his 10th HR of the season, 4/23 at MIL, in the team's22nd game of the season, tying Cy Williams (1923) forthe 2nd-fewest games into a season needed for aPhillie to reach 10 HR; Mike Schmidt did it in the first12 games in 1976...Had an extra-base hit, RBI and run scored in 9 straightgames, 5/25-6/3; had 20 RBI in the 9 games...Set a career high with 6 RBI, 5/26 vs COL...Made 2 starts at 1st base: 4/25 at PIT and 5/6 at ARI...Hit a 2-out, 2-run double in Game 1 of the NLDS vs MILto give the Phillies a 2-0 lead in their 3-1 win...Became the 3rd player in NLCS history to walk 4 timesin a game, 10/10 vs LAD (others: Darren Daulton,10/10/93 vs ATL and Ken Caminiti, 10/8/98 vs ATL)...Became the 34th player in WS history to hit a HR in his1st at-bat, 10/22 vs TB (Scott Kazmir). Became the first Phillies 2nd baseman to be elected as an NL All-Star starter twice... Led all MLB 2nd basemen in RBI (103), SLG % (.571) and OBP (.413) and T-1st in 2B (48)... Led the NL in HBP (25), finished 2nd in home AVG (.372), 3rd in AVG (.332) and AVG vs RHP (.340), T-3rd in 2B and 3-hit games (20), 6th in OBP (.410),7th in SLG % (.566) and T-9th in extra-base hits (75)... Set career highs in AVG, 2B and HBP... His 25 HBP set a single-seasonfranchise record... Also set a single-season franchise record in 2B by a 2nd baseman... Had the most doubles in April (13) bya Phillie since divisional play began in 1969... Became the 1st MLB player to have 40 doubles in 95 team games since 1996,when Edgar Martinez did it in 81 team games for SEA... Is just the 4th Phillie since 1935 to have back-to-back 40-doubleseasons (others: Pete Rose, Bobby Abreu and Jimmy Rollins)... Named NL Co-Player of the Week, 4/23-29 (.444, 12-27, 3 2B, 2HR,10 RBI, 7 R, .778 SLG)... Had his first career 5-hit game, 4/25 vs WSH... Was on the 15-day DL,7/27-8/27 (broken right hand),missing one month of the season... Had a team-best 19-game hitting streak, 9/5-25 (.333, 27-81, 4 HR, 13 RBI)... Made onestart at 1st base, 9/9 vs FLA... Hit a game-tying HR off Tom Glavine in the 6th inning, 9/14 at Shea Stadium... Was the 9thhardestplayer in the NL to double-up (1 GIDP/75.7 AB). Played for Team USA in the inaugural World Baseball Classic...Became the 15th player in MLBhistory with a .300 AVG, 200 H, 30 HR, 100 RBI, 40 2B and 130 runs in one season and the 2nd Phillie (Hall of Famer Chuck Klein, 1930 & 1932)...Elected by the fans as the starting 2nd baseman for the All-Star Game, his 1st All-Star appearance...Became the 3rd Phillie in club history with 200 hits and 30 HR in the same season, joining Klein (4 times -1929-32) and Lefty O'Doul (1929); 44th player in ML history to do it and one of two in 2006 (Vladimir Guerrero)...17th Philliein club history with 200 hits and 1st since 1999 (Doug Glanville)...His hit total was the most by a Phillies 2nd baseman since1975, when Dave Cash led the NL with 213...First 2nd baseman in Phillieshistory with multiple 100-RBI seasons...Led the NL in runs (130) and tied forthe lead in multi-hit games (64), finished 2nd in hits (203), 3rd in at-bats (658),T-3rd in games (160), 5th in total bases (347), T-6th in HBP (14), T-8th in gamewinningRBI (14) and 10th in batting average (.309) and average vs RHP(.312)...Led all MLB 2nd basemen in hits (198), HR (31), RBI (100), runs (128),extra-base hits (74), total bases (338), go-ahead RBI (22) and game-winning RBI(14)...Had the 2nd-most hits (65) in the NL vs LHP...Batted .327 (55-168), 5HR, 21 RBI vs LHP from 5/21 through the remainder of the season...Set Phillies single-season records for HR and runs scoredby a 2nd baseman...Had a 35-game hit streak, 6/23-8/3 (.405, 62-153, 14 2B, 2 3B, 9 HR, 30 RBI, .699 SLG), tied for 10th longestin MLB history and tied with Luis Castillo for longest ever by a 2nd baseman...Had 23 multi-hit games during the streak...Had his 6th and 7th career multi-HR games, 4/13 at ATL and 4/14 at COL, becoming just the 2nd Phillie in the last 70 years tohave multi-HR games on consecutive days (Scott Rolen - 1999); Dolph Camilli did it for the Phils in both 1935 and 1936...Alsohad 9 RBI in the 2-game span, including his 3rd career grand slam, 4/14 at COL...Overall, tied a Phillies record with 7 multi-HR games in one season...Got his 1st career ejection, 4/23 vs FLA, by 1B umpire Dan Iassogna...Named NL Player of theWeek, 5/1-7 (.483, 14-29, 2 2B, 3 HR, 8 RBI, 9 R, .862 SLG) and Co-Player of the Week, 7/24-30 (.441, 15-34, 2 2B, 3B, 5 HR, 11 RBI,1.000 SLG)...Won NL Player of the Month honors for July (.425, 45-106, 13 2B, 2 3B, 6 HR, 24 RBI, 26 R)...Hit his 2nd careerwalk-off HR in the 10th inning, 9/4 vs HOU (Dave Borkowski)...Tied for the NL lead with 10 HR in September, his 1st careerdouble-digit HR month...T-7th in NL MVP voting with NYM's Jose Reyes, garnering 98 points. Earned NL Player-of-the-Week honors for July 11-17, batting .471 with an NL Leading 10 RBIs. ... Drove in a career-high five RBIs twice in 2005, against Colorado (July 28) and Cincinnati (Sept. 23). ... Clubbed 26 of his 28 homers as a second baseman, tying him with Juan Samuel for the most at that position in team history. Began season with Scranton/Wilkes-Barre (AAA)...Hit .400 (6-15), 6 R, 2 2B, 1 3B, 2 HR, 6 RBI over 3-game span, 4/16-18 vs Rochester...Recalled on 5/8 (Polanco DL'ed)...Went 2-for-4, 2B, RBI in 1st start, 5/11at SF (2nd base)...Had 14 RBI in 6 games, 5/16-22...Homered in 3 straight games, 5/20-22...Hit .364 (16-44) duringa career-best 11-game hit streak, 5/16-28 (3 2B, 1 3B, 4 HR, 15 RBI)...Made 1st career start/appearance at 1stbase, 6/12 at MIN...Optioned to Scranton, 6/15, and hit 2 HR in his first game back, 6/18 vs Pawtucket...Recalledon 6/24 (Ledee DL'ed)...Hit 1st career-pinch-HR, 6/28 vs MTL (Claudio Vargas), into the RF upper deck...Hit gametyingHR in 9th inning, 7/9 vs ATL (John Smoltz); Phils won 7-6 in 10 innings...Twice tied his career high with 4 RBI,7/22 vs FLA and 8/21 at MIL...Made 57 starts: 46 at 2B and 11 at 1B...Started in each spot of batting order except4th and 9th...Finished 5th in NL in RBI ratio (1 RBI/4.68 AB) among players with at least 250 at-bats...Hit .355 (11-31), 2 2B, 3 HR, 10 RBI, 3 BB as pinch-hitter; ranked tied for 3rd in the majors in pinch-HR, 4th in pinch-avg andtied for 7th in pinch-RBI. Returned to 2nd base during spring training ... Began season with Phillies as an extra man ... Made ML debut, 4/4 vs PIT (struck out in pinch-AB) ... Turned out to be his only at-bat before being optioned to Scranton (AAA), 4/6 (RHP Eric Junge recalled) ... Recalled on 4/24 (2B Placido Polanco on DL) ... Made 1st ML start, 4/24 vs COL, and hit a grand slam in his 2nd at-bat of the game for his 1st ML hit ... Became 3rd Phillie in franchise history to hit a grand slam for his 1st hit and 1st since Jim Command, 7/11/54 at BKN ... First Phillie to homer for his 1st hit since Marlon Anderson, 9/8/98 vs NYM ... Overall, went 2-for-4, 2B, HR, 4 RBI in 1st ML start ... Optioned back to Scranton, 5/1 (Polanco activated) ... Clubbed 2 HR, 5/28 vs Columbus ... Phillies Minor League Player of the Week, 6/2-8 (.482, 1 2B, 2 HR, 5 RBI, 6 R, 1 BB, 1 SB) ... Batted .500 (24-48), 4 2B, 3 HR, 6 RBI during 12-game hit streak (9 multi-hit) to raise avg from .307 to .348 ... Starting 2nd baseman for International League in Triple-A All-Star Game ... Homered in back-to-back games 3 times, including final two minor league games, 8/12-13 vs Buffalo ... Named Red Barons Player of the Year ... Finished 3rd in International League in avg (.323), tied for 2nd in runs (80), 3rd in slugging % (.517) and 4th in on-base % (.390) ... Recalled on 8/14 (RHP Brandon Duckworth optioned) and became everyday 2nd baseman (Polanco moved to 3B) ... Was hitting .405 with 4 HR in 12 August games at time of promotion ... Hit .364 (8-22), 2 2B, 3 RBI in first 6 games with Phillies ... Stole 1st ML base, 8/30 at NYM ... Trailing 3-2 with bases loaded in 8th inning, 9/2 vs MTL, hit 1st ML triple (Javier Vazquez) in 5-3 win ... Reached base in 4 of 5 plate appearances and scored career-high 3 runs, 9/9 at ATL (H, 2 BB, 2 HBP) ... Hit 2nd career HR, 9/11 at ATL (Greg Maddux) ... Hit GW RBI single in 10th inning, 9/27 vs ATL in 7-6 win ... Was final batter in history of Veterans Stadium, 9/28 vs ATL (grounded out) ... Named 4th-best prospect in IL baseball by Baseball America. Non-roster invitee to big league camp . . . Was converted from a 2nd baseman to a 3rd baseman during spring training . . . Made the jump from single-A Clearwater to triple-A Scranton . . . Recipient of Paul Owens Award as the best player in the Phillies minor league system . . . Set a Scranton single-season record and led the International League with 39 doubles . . . Tied for 3rd in IL with 57 extra-base hits . . . Led team with 17 HR . . . Phillies Minor League Player of the Week, 4/15-21 (.444, 8-18, 2 HR, 8 RBI) . . . Went 4-for-5 with 2 doubles, HR, 5 RBI and 4 runs, 6/24 vs Columbus . . . Sprained his left ankle, 8/12 at Pawtucket, missing 17 games . . . His fielding improved as the season went on -made 14 errors in first 25 games and another 14 in his final 68 games, including just 5 in his final 41 games . . . Played for Grand Canyon in Arizona Fall League . . . Rated the 14th-best prospect in the IL by Baseball America. Non-roster invitee to big league camp . . . Spent entire season with Clearwater (A) . . . Tied for team lead in HR (16), 2nd in hits (120) and tied for 2nd in stolen bases (19) . . . Florida State League All-Star . . . Participated in Major League Baseball's All-Star Futures Game played at SAFECO Field (2-3, HR, 2 RBI, SB, 2 runs) . . . Led all FSL 2nd basemen in total chances (574) . . . Phillies Minor League Player of the Week, 7/2-8 (.615, 1 3B, 2 HR, 6 RBI) . . . Was 3-for-3, 3 R, 1 HR, 4 RBI, 7/6 vs Dunedin . . . Had season-high 12-game hit streak, 8/18-29 (.457, 21-46, 4 2B, 3 HR, 10 RBI); 7 of 12 games were multi-hit games . . . Played in FIL. Phillies 1st selection (15th overall) in June draft . . . Made pro debut with Batavia (A), 7/30 vs Vermont . . . Tied for team lead in doubles (13) . . . Batted safely in 29 of 40 games with 14 multi-hit games . . . Hit .368 (7-19) in first 4 pro games . . . Reached base safely in 18 straight games, 8/9-24 . . . Hit 1st pro HR, 8/12 vs Utica . . . Phillies Minor League Player of the Month for August . . . Hit .353 (6-17), 2 2B, 1 HR, 7 RBI in final 4 games . . . Hit .286 (2-7), 1 RBI in 2 New York-Penn League playoff games . . . Played in Florida Instructional League . . . Named Phillies' 5th-best prospect by Baseball America. November 9, 2018 Los Angeles Dodgers released 2B Chase Utley. September 1, 2018 Los Angeles Dodgers activated 2B Chase Utley from the 10-day disabled list. August 2, 2018 Los Angeles Dodgers placed 2B Chase Utley on the 10-day disabled list. Left wrist inflammation. June 22, 2018 Los Angeles Dodgers activated 2B Chase Utley from the 10-day disabled list. February 17, 2018 Los Angeles Dodgers signed free agent 2B Chase Utley. November 2, 2017 2B Chase Utley elected free agency. February 18, 2017 Los Angeles Dodgers signed free agent 2B Chase Utley. November 3, 2016 2B Chase Utley elected free agency. December 9, 2015 Los Angeles Dodgers signed free agent 2B Chase Utley. November 7, 2015 2B Chase Utley elected free agency. August 21, 2015 Los Angeles Dodgers activated 2B Chase Utley. August 19, 2015 Philadelphia Phillies traded 2B Chase Utley and cash to Los Angeles Dodgers for RHP John Richy and 2B Darnell Sweeney. August 7, 2015 Philadelphia Phillies activated 2B Chase Utley from the 15-day disabled list. August 4, 2015 Philadelphia Phillies sent 2B Chase Utley on a rehab assignment to Reading Fightin Phils. August 2, 2015 Philadelphia Phillies sent 2B Chase Utley on a rehab assignment to Lehigh Valley IronPigs. June 21, 2013 Philadelphia Phillies activated 2B Chase Utley from the 15-day disabled list. 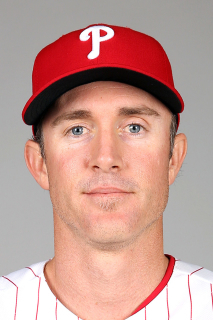 June 19, 2013 Philadelphia Phillies sent 2B Chase Utley on a rehab assignment to Reading Fightin Phils. May 24, 2013 Philadelphia Phillies placed 2B Chase Utley on the 15-day disabled list retroactive to May 21, 2013. Right oblique strain. June 27, 2012 Philadelphia Phillies activated 2B Chase Utley from the 15-day disabled list. June 26, 2012 Clearwater Threshers sent 2B Chase Utley on a rehab assignment to Lehigh Valley IronPigs. June 12, 2012 Chase Utley assigned to Clearwater Threshers. April 3, 2012 Philadelphia Phillies placed 2B Chase Utley on the 15-day disabled list retroactive to March 26, 2012. Ddeterioration of the cartilage behind his left kneecap. May 23, 2011 Philadelphia Phillies activated 2B Chase Utley from the 15-day disabled list. May 10, 2011 sent 2B Chase Utley on a rehab assignment to Clearwater Threshers. March 30, 2011 Philadelphia Phillies placed 2B Chase Utley on the 15-day disabled list retroactive to March 22, 2011. Right knee tendinitis. August 17, 2010 Philadelphia Phillies activated 2B Chase Utley from the 15-day disabled list. August 14, 2010 sent 2B Chase Utley on a rehab assignment to Clearwater Threshers.